Check out our most recent work by our favorite artists and new artists! Some shown in a sample installation to better imagine how these pieces would work wonderfully in your home. Abstract 11 by Laura Park creates a virtual Symphony of color in this refined space. John Schuyler. (L) Eterno 91 48x48" (R) Atratto 92 48x48"
"Opening Night" by Theresa Girard ramps up the sophistication of this room! Lesley Rich (L) Pushkin Meets Tschaikovsky 36x36" (R) Round Midnight 36x36"
"State of Wonder" by Jessica Pisano makes a wonderful statement in this dining area! 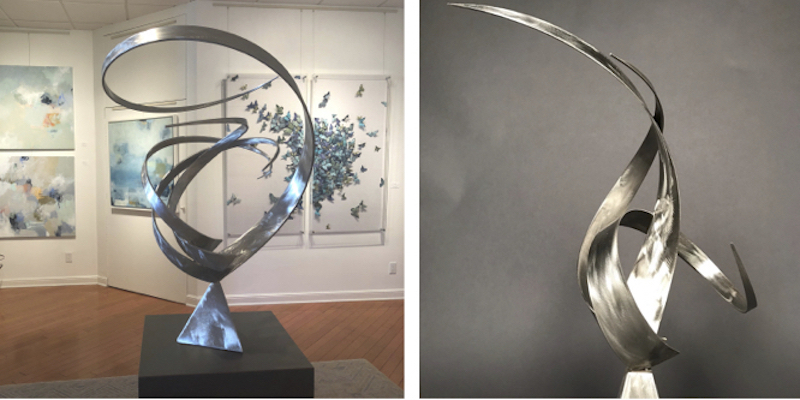 Bruce Niemi (L) Protected 29x23x22" (R) Wind Whisperer 29x17x17"
Wow! "Day Into Night" by Donna Bruni works beautifully with the dramatic rug to bring this room alive! Did you know we have a whole section of our website devoted to installations? AND…each artist's page has a link to their installations too!